Queen Elizabeth II has declared the London 2012 Paralympics officially open, during a spectacular opening ceremony watched by some 80,000 spectators. Britain’s first Paralympic Games gold medallist, Margaret Maughan, 84, had the honor of lighting the cauldron. Earlier, athletes paraded around the Olympic Stadium, with Paralympics GB entering last to huge cheers. 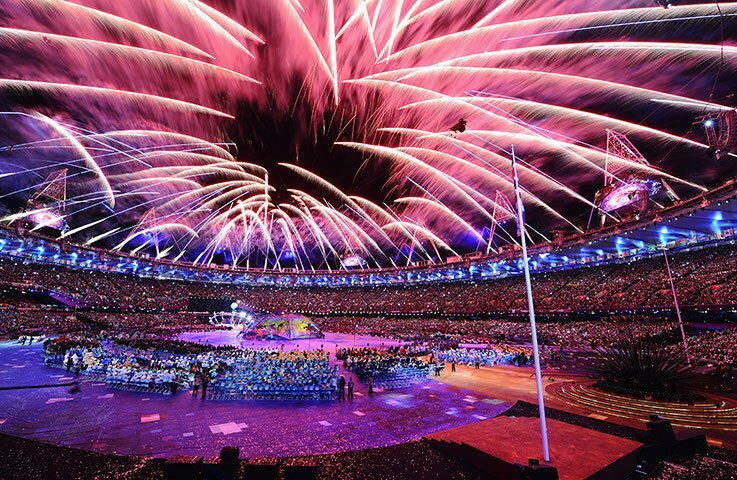 The opening ceremony, co-directed by Jenny Sealey and Bradley Hemmings, signalled the start of 11 days of competition by 4,200 athletes from 164 countries, including more than 300 athletes from the home nation. Wheelchair basketball, shooting, swimming and track cycling are among the events set to feature on the opening day. Eight members of the British under-22 wheelchair basketball team were given the honor of carrying the Paralympic flag into the stadium. It was raised by members of the armed forces, before the Queen declared the Games open. British swimmer Liz Johnson, a medallist from Beijing 2008, wheelchair rugby judge Richard Allcroft and David Hunter, who is coaching the Paralympics GB equestrian team, each stepped forward to take the official oaths on behalf of competitors and officials. At the close of the ceremony, 24-year-old Royal Marine Commando Joe Townsend – an aspiring Olympic triathlete, who lost both legs while serving in Afghanistan – descended on a zip wire into the stadium from the top of the nearby Orbit tower. He handed the flame to David Clarke, a member of the Parlympics GB five-a-side football team, who passed the torch to Margaret Maughan, who won gold in archery at the 1960 Rome Paralympics. She lit a tiny flame on the ground, igniting more than 200 copper petals. Long stems then rose towards each other to form a cauldron, signifying unity. Like the impressive Olympic cauldron, it was made by designer Thomas Heatherwick, and 166 of the petals bore the names of competing nations at the London 2012 Paralympics. Bradley Hemmings said it was “extremely spectacular and like nothing you have seen in previous ceremonies”. The Paralympics GB athletes earlier entered the stadium to David Bowie’s Heroes, led by Peter Norfolk, the two-time Paralympic wheelchair tennis champion, who carried the union jack. He later described it as a “wow moment”. In one heart-stopping moment during the show, six Paralympians and former competitors – including Baroness Tanni Grey-Thompson – were flown into the stadium in golden wheelchairs. Disabled ex-serviceman David Rawlins flew a twin-engined Tecnam P2006 light aircraft over the stadium to kick off the proceedings. A sphere ignited the “big bang” – something which Prof. Stephen Hawking, a world-renowned physicist who has motor neurone disease, has written about extensively – to start the show and fireworks lit up the stadium. Prof. Stephen Hawking and actor Sir Ian McKellen played prominent roles in the ceremony, which also featured a host of deaf and disabled artists, local children and performers newly-trained in circus skills. Some 3,000 volunteers took part in the event, which organizers entitled Enlightenment and said was “profoundly about science and humanity”. Throughout the ceremony, Prof. Stephen Hawking acted as a guide to Miranda – a character from William Shakespeare’s play The Tempest, who was central to the show – while actor Sir Ian played Prospero, another character from the play. Inspired by uncertain British weather, umbrellas were also a big theme in the ceremony, which was described as “both spectacular and deeply human” by organizers. The Queen was welcomed by Sir Philip Craven, President of the International Paralympic Committee, before the union jack was carried in by representatives of the armed forces. It is the first time the monarch has officiated at the openings of both the Olympic and Paralympic Games. Teams from all 164 countries paraded into the stadium to music mixed and played by three London-based DJs. The Paralympic torch began its journey in Stoke Mandeville, Buckinghamshire, the spiritual home of the Paralympic Games, on Tuesday night. It was carried by 580 torchbearers in total, and after being carried past some of London’s most famous landmarks, was used to light a scaled-down version of the Olympic cauldron. The torch had earlier been delayed but Games organizers LOCOG confirmed the flame arrived at the stadium in time to light the cauldron. More than 2.4 million tickets for events have already been sold, including half a million to overseas visitors. In a statement released before she opened the Games, the Queen said: “It is with tremendous pride that the people of London and the United Kingdom welcome the world to the London 2012 Paralympic Games.